It's Rurouni Kenshin episode 3! Only with better visuals! And you only see 2 minutes of it! It’s 1893. 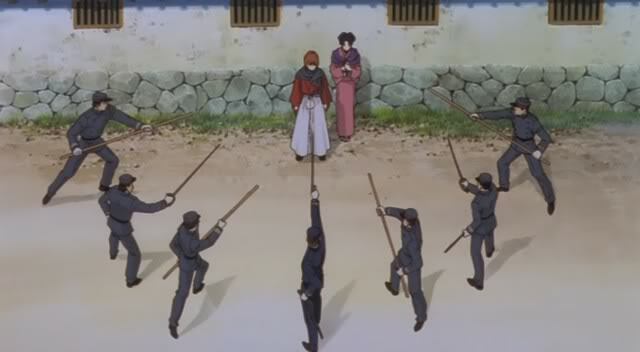 Kenshin had long past relinquished swordsmanship, allowing Yahiko to inherit the sakabatou. At the request of the Japanese government, Kenshin had gone to the Asian continent to serve in the Sino-Japanese War. The war had ended, and Kaoru waits for Kenshin at the port every day. In the meantime, she reflects upon their lives together. Rurouni Kenshin: Seisou-hen (るろうに剣心：星霜編, released in the US by ADV as Samurai X: Reflection) is the finale OVA to the Rurouni Kenshin franchise. I love Rurouni Kenshin, and for that reason, I feel Seisou-hen just failed to do any justice. The problem lay with the story, or lack thereof. Seisou-hen was a two-part OVA, each about 45 minutes long. The first part was essentially recapping the first 60 episodes of the TV series all in a period of about 30 minutes. As for the second part, fans of the manga may rejoice that the Jinchu arc has finally received an animated adaptation. However, the only thing you see is the Kenshin/Enishi fight on the beach as pretty much the rest of the narrative was ignored. Even fitting one arc into about twenty minutes was bad enough, so you can imagine how catastrophic the first part’s attempt was at being the Cliffsnotes version of Rurouni Kenshin up until the Kyoto arc. To add insult to injury, the very premise of the OVA actually contradicted the manga, which ended with Kenshin permanently renouncing swordsmanship so he could raise his family. Rurouni Kenshin featured one of my all-time favorite ensemble casts. However, I just had a hard time watching them in Seisou-hen, particularly Kenshin and Kaoru. Kenshin especially had turned into an absolutely pathetic shell of his former self. This OVA ultimately wound up feeling like it was meant to follow up Tsuioku-hen rather than the main series. While the story was a disgrace, at least it was presented decently. Seisou-hen adopted a quasi-stylized look where characters looked more realistic than they did in the TV series, but more stylized than they did in Tsuioku-hen. Overall, the animation looked good, but somehow it didn’t seem to appeal to me as much as Tsuioku-hen’s did. I think part of it was that Seisou-hen’s color palette just seemed a little drab compared to the bright colors used in Tsuioku-hen. I didn’t feel like some of the characters translated well into the new look Seisou-hen went for, particularly Sanosuke. Also, I’m not sure how I felt with the fact that Kenji was just a recycled Kenshin Tsuioku-hen character model. Once again, the music was scored by Iwasaki Taku. As proven before, Iwasaki can write a great score. However, the problem with the music was that there was entirely too much of it. In Tsuioku-hen, background music stayed in the background like it should. However Seisou-hen almost seemed to want the music to take equal presence as the characters, and the music just wound up overwhelming many scenes. Kenshin: Thank you for everything. It was primarily Ueda Yuji’s voicing of Sanosuke that proved how his character model just didn’t fit. To be fair, Sanosuke had a really stylized design in the manga, so any attempt to make him look more realistic at all would just look odd. Nonetheless, I thought the fact that Ueda voiced him exactly like in the series was what made Sanosuke’s model just seem so weird. Rurouni Kenshin: Seisou-hen met with a very mixed reaction when it came out. Even manga-ka Watsuki Nobuhiro expressed disgust at how maligned the source material he gave them was. It’s because of Seisou-hen I’m a little worried about the upcoming Shin Kyoto-Hen OVA as that’s basically taking the Kyoto arc, dividing it into two 45-minute-long parts, and then narrating it from Misao’s point of view. While Tsuioku-hen OVA and the series both easily make the top 10 anime I have ever seen, I think it’s best that we all forget that Seisou-hen ever existed and stick with the later manga chapters.